BEFORE DELVING INTO the oral argument, though, let’s take a quick look at the background of the case. As soon as the Supreme Court ruled in favor of the Second Amendment in June 2008, declaring the District of Columbia’s handgun ban unconstitutional in District of Columbia v. Heller, suits were immediately filed against Chicago’s nearly identical handgun ban. Back in 1833, the Supreme Court ruled that the Bill of Rights applies only to the federal government--not directly to state and local governments. Heller involved a direct application of the Second Amendment, because the D.C. city council has no independent powers--all of its powers are delegated by Congress, based on Congress’s explicit constitutional power to govern the national capital district. After the Civil War, Congress passed, and the states ratified, the 14th Amendment, which expressly limits the actions of state governments. The 14th Amendment’s Privileges or Immunities clause declares: “No State shall make or enforce any law which shall abridge the privileges or immunities of citizens of the United States.” Legal scholars across the political spectrum agree that Congress intended this clause to protect all of the first eight amendments, especially the Second Amendment, against infringement by the states. Unfortunately, in 1873 in The Slaughter-House Cases, a 5-4 Supreme Court majority basically nullified the Privileges or Immunities clause. In the Chicago cases, the NRA and Gura each argued in favor of incorporation under both the Due Process and Privileges or Immunities clauses of the 14th Amendment. 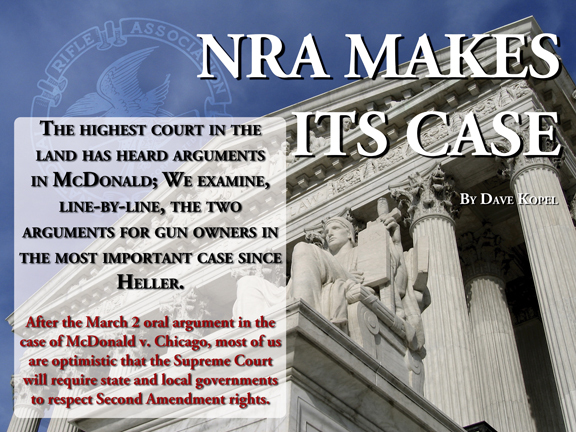 The Supreme Court granted the appeal in McDonald and made the NRA a party in the case. As the briefs were filed, Gura increasingly concentrated on reviving the Privileges or Immunities clause, but the NRA rightly recognized it was unlikely that a majority of the justices would be willing to overrule the 137-year-old Slaughter-House precedent. Therefore, in order to protect the future of the Second Amendment, it was critical that the NRA put forward a strong argument for incorporation through the more straightforward Due Process clause. To do that, the NRA requested part of the oral argument time, and the request was granted. The March 2 oral arguments proved the NRA’s request, and the choice of former Solicitor General Clement, to be a wise and necessary strategy. By the time Gura’s time was expired, it appeared that there was little, if any, support for his Privileges or Immunities argument. During the NRA argument, the three justices who had previously dissented in Heller (John Paul Stevens, Stephen Breyer and Ruth Bader Ginsburg), along with Sonia Sotomayor, who had since replaced Heller dissenter David Souter, began searching for a way to incorporate the Second Amendment in the weakest way possible. The one exception to this general rule is the Sixth Amendment guarantee of jury trials in felony criminal prosecutions. There, the Supreme Court has ruled that the Sixth Amendment applies to the states, but does not apply “jot for jot.” So whether in federal court or in state court, a criminal defendant is entitled to a jury trial. Yet state courts do not have to follow the Sixth Amendment federal standard that juries must consist of 12 persons, or the federal standard that jury verdicts must be unanimous.